Retail giant Aldi has announced plans to hire additional area managers across the country as part of its ongoing €160m expansion plans. Aldi is Ireland’s fastest-growing retailer and it is currently investing €100m into its extensive portfolio of 137 stores across the Republic of Ireland. Aldi is currently in the process of investing an additional €60m into Project Fresh, a project which will see the revamp of its existing Irish stores. Aldi is now inviting applications from experienced professionals who are looking for a change of career. The recruitment campaign will see the retailer grow its area manager team to support the ongoing expansion and oversee the new stores for the Irish business. Are you looking for an exciting professional challenge with a vibrant, expanding company? If you want to test your skills on a daily basis and satisfy your need for professional and personal development, then this could be the job for you. What is the salary for an Aldi area manager? The starting salary for career changer area managers is €75,500, rising to €101,600 after four years. In addition to this highly competitive salary, area managers will also be entitled to an attractive benefits package. This includes a fully-expensed Audi A4, five weeks’ holidays per year plus bank holidays, private healthcare after six months, a pension scheme and life assurance. It’s not just the benefits that make this an attractive opportunity. It is also a great chance to build a successful management career with a pioneering company, with many of Aldi’s senior executives starting out as area managers. You’ll need a 2:1 degree in any subject, an Irish driving licence, the right to work in Ireland and experience of managing, leading and developing teams. The application process is highly competitive so you’ll also need to prove that you’re the best person for the job. Candidates must be able to demonstrate their leadership qualities and it’s important that they have a flexible, understanding approach so that they can succeed in this fast-growing business. This is an excellent opportunity for experienced managers to take the next step in their career. Do I need experience in retail? You don’t need to have worked in retail to apply. If you have previous management experience but you’re looking for an exciting new challenge, this could be just what you’ve been waiting for. You’ll be given world class training and everything you need to succeed in the role. Successful candidates will be assigned a dedicated mentor from day one to help them achieve their potential with Aldi. You can also draw on Aldi’s incredible support network to help you excel within the role and contribute to the company’s continued growth. Area managers will take responsibility for up to four stores following a comprehensive training programme. 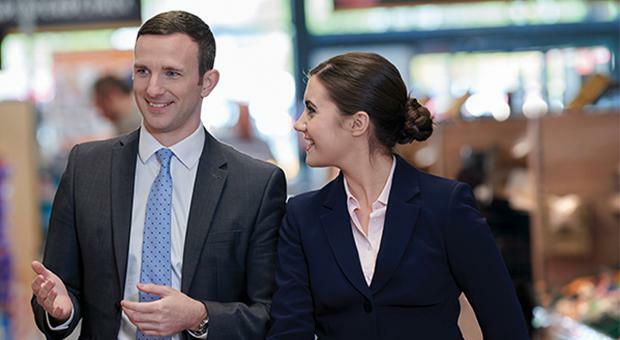 As an area manager, your job will be to support the people, processes, targets and smooth running of up to three or four stores. The store managers, deputy store managers and store assistants will look to you for leadership, ideas and support. You’ll report to the store operations director and act as the link between your stores and the warehouse teams at the Regional Distribution Centre. Aldi’s area managers are expected to provide their teams with the best support they can. That means that you will have to work some weekends and bank holidays but Aldi will reward this flexibility and do their best to accommodate their area managers’ needs. Will I need to relocate for the job? It’s possible but usually it will only be within your chosen region. Aldi currently has 137 stores across the country but you’ll be asked to choose a preferred region when you apply. Aldi is always flexible and accommodating when it comes to location requests but, with the demand for area managers set to grow across the country, candidates may need to compromise on where they will be working. Applications are now open. Aldi recruit on a rolling basis so they will be hiring new area managers throughout the year. If you’ve applied for this role before but were unsuccessful, you’ll need to wait 12 months before you can apply again. However, you can still apply for other roles with Aldi within those 12 months. How do I apply for the area manager position? Candidates will have to complete an online application and undergo various tests to assess their judgement and analytical skills. They’ll also be sent a psychometric test to assess whether they have the core skills and personal qualities required for the job. Finally, there will be an online interview to give candidates a chance to showcase what they can bring to the role. After that, there’ll be a group assessment to check out your teamwork and to see how you work with other people. This is your chance to show you’re a natural leader. Finally, if you pass all of those tests, you’ll have a final interview with your regional managing director. Would you like to completely refresh your career? Are you doing a job that just isn’t you anymore? Are you ready to start a rewarding and long-lasting career? Are you seeking a role to provide you with the responsibility that you have always wanted? Apply now for the Aldi Area Manager Programme.